The contrast in global climate change leadership (or lack thereof) has led news outlets to portray Canada as a leader in environmental politics. Is Canada really doing as well as is being portrayed, or is the growing contrast with the US giving us undeserved credit? 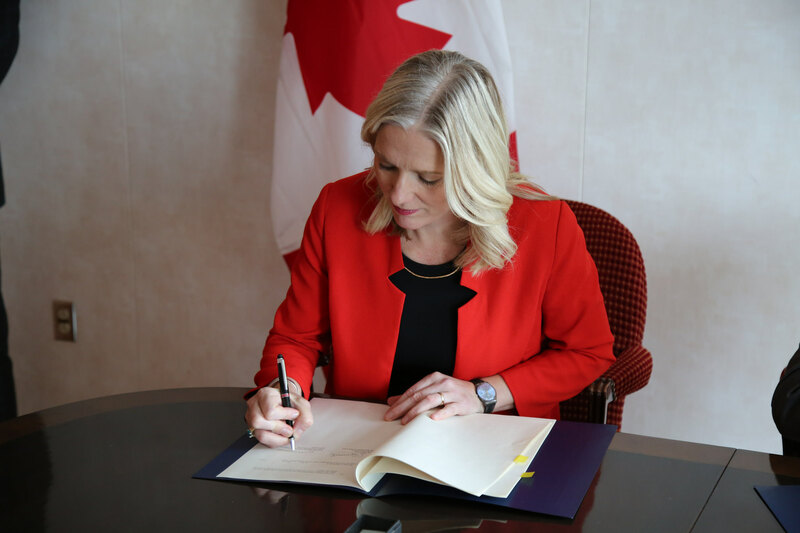 Minister of Environment Catherine McKenna signs a Memorandum of Understanding on Environmental Cooperation between Canada and Rwanda in 2017. In contrast to Trump, Trudeau’s Liberals have included environment in both their party platform and the mandate for Catherine McKenna, the minister of Environment and Climate Change. One of the main points in the mandate was to create a pan-Canadian framework for addressing climate change. A first step to fulfilling this mandate was unveiled in 2016 with Prime Minister Justin Trudeau’s announcement that provinces had until 2018 to adopt either a carbon pricing structure or cap-and-trade system. If provinces failed to meet this deadline, the federal government would step in and implement a structure on their behalf. The structure for carbon taxing stipulates that “the levy needs to be at least $10 per tonne to start, then rise by annual $10 increments until it is $50 per tonne in 2022. For provinces opting for a cap-and-trade approach, each one’s emissions cap had to be sufficiently lowered over time as to allow Canada to meet its 2030 [greenhouse gas] target.” Minister McKenna also believes that the national movement to reduce greenhouse gases will aid in the growth of Canada’s clean-tech and energy sector. British Columbia, Alberta, Ontario, and Quebec met these requirements by the beginning of 2017. New Brunswick, Prince Edward Island, and Newfoundland and Labrador committed to provincial carbon pricing plans by the 1st of January 2018. Saskatchewan’s newly unveiled climate change strategy does not include a carbon tax or cap-and-trade system, and New Brunswick’s existing gas tax is not being counted. At the end of 2017, Minister McKenna acknowledged the step forward from Saskatchewan but said that it would not suffice in adhering to federal guidelines. On January 15th, 2018, the government drafted legislation proposing that revenue raised by the federal government through carbon pricing could be returned either to the government of the province where the citizen lived, or directly to the citizens themselves. While most provincial governments will receive revenue from an approved carbon plan, those provinces that do not meet the carbon pricing requirements could be bypassed, with the federal government sending rebate cheques directly to individual residents. The two provincial governments negatively affected by this legislation are Saskatchewan and New Brunswick. 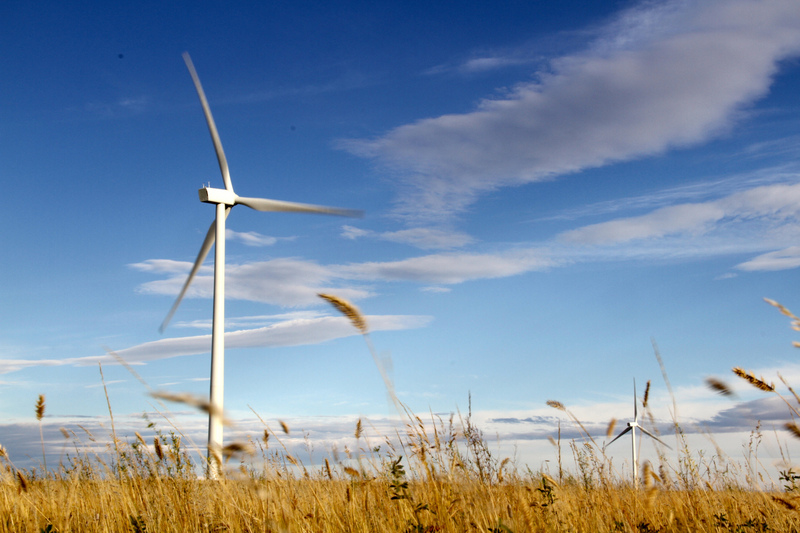 Summerview wind farm in southern Alberta. Carbon pricing is one of the strategies being implemented by the Canadian government as a part of their Nationally Determined Contributions (NDC). NDCs are determined by each individual country and outline their contribution toward the goal of staying below a global average temperature increase of two degrees centigrade, as outlined in the Paris Climate Accord. Canada has committed to reducing greenhouse gas emissions by 30 percent below 2005 levels by 2030. This year at COP 23 – an annual United Nations Climate Change Conference – Canada and the United Kingdom led the creation of the Powering Past Coal Alliance (PPAC). The PPAC – comprised of 20 countries, six provinces or states, and one city – are committed to phasing out coal in their jurisdictions. Currently, 10% of Canada’s electricity is coal generated, accounting for three-quarters of all electricity-related greenhouse gas emissions. According to the Toronto Star, “eliminating coal and replacing it entirely with non-emitting renewables would get Canada about one-third of the way to its 2030 emissions reduction target.” However, Climate Action Tracker – an independent research organization – rates Canada’s current actions as highly insufficient to meeting our NDC. Not only is Canada not on track to meet our Nationally Determined Contributions, but we have also not taken the pollution Canadian corporations produce internationally into account in these calculations. As such, Canada has a long way to go before we can begin to call ourselves genuine role models in the movement against climate change. Pipelines are a hot topic in any discussion over climate change and the environment, especially in Canada. Last year, the federal government approved Kinder Morgan’s Trans Mountain Pipeline, Enbridge’s Line 3, and, with Trump’s support, Keystone XL. Our national unity was questioned when TransCanada – an oil company based in Alberta – closed the book on the Energy East pipeline. Immediate anger emerged from the prairie provinces where the oil would have originated from, and New Brunswick, where the oil from the pipeline was to be refined. Saskatchewan premier Brad Wall went as far as to question the West’s role in the federation, with tensions exacerbated by then-Montreal Mayor Denis Coderre calling the termination of Energy East “an enormous victory.” Natural Resources Minister Jim Carr stated that the cancellation of the project was simply a “business decision.” Others, however, claimed that pipeline projects were being restricted by environmental regulations. The oil and gas industry forms the basis of livelihood for many Canadians, and it may always exist as a source of controversy and conflict. However, we must be wary of the potential of pipeline conversations to deepen regional divisions and derail national environmental efforts, such as on the Pan-Canadian Framework on Clean Growth and Climate Change. It is irresponsible and insensitive for Canadian politicians to dismiss pipelines without acknowledging the need for transitional programs and services for those who depend on the oil and gas industry for their livelihood. Conversely, it is just as irresponsible for pipeline supporters to overlook the need to be environmentally conscious while looking to support a healthy economy. The importance of cooperation and compromise is often cited in discussion over the nature of federations like Canada. Due to the fact that pipelines are so inherently tied to the economic survival of the federation, we must remember the need for compromise when engaging in these discourses. Moreover, it is important to acknowledge that pipeline discourse monopolizes a lot of the conversation on climate change in Canada. This is problematic because it often detracts from the plethora of other domestic environmental issues, such as food insecurity. Overshadowed by energy, this issue disproportionately affects Indigenous peoples. Nunavut lags behind the rest of Canada with ¼ people experiencing food insecurity, compared to 10% in other provinces. Addressing pipeline issues is important, but we must be wary of allowing their rhetorical dominance to hide inaction on other critical issues. Alberta: Emerging Climate Change Leader? 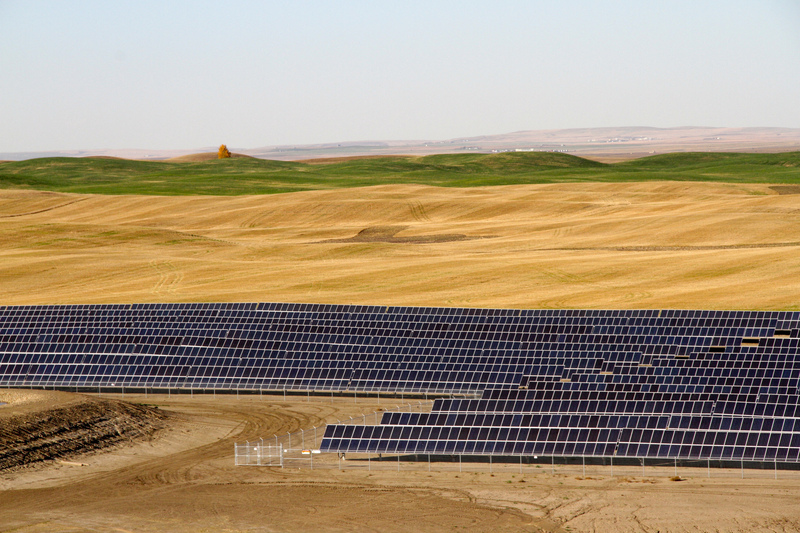 Green Acres Solar Farm in south eastern Alberta. The end of 2017 saw the launch of the largest solar project in Western Canada beginning in Brooks, Alberta. The project was kick-started with a $15 million grant from the former Progressive Conservative government through the Emissions Reduction program. The installation of 50 000 solar panels provides power to 3 000 homes. This project is particularly innovative in making use of southern Alberta’s abundance of sunlight. 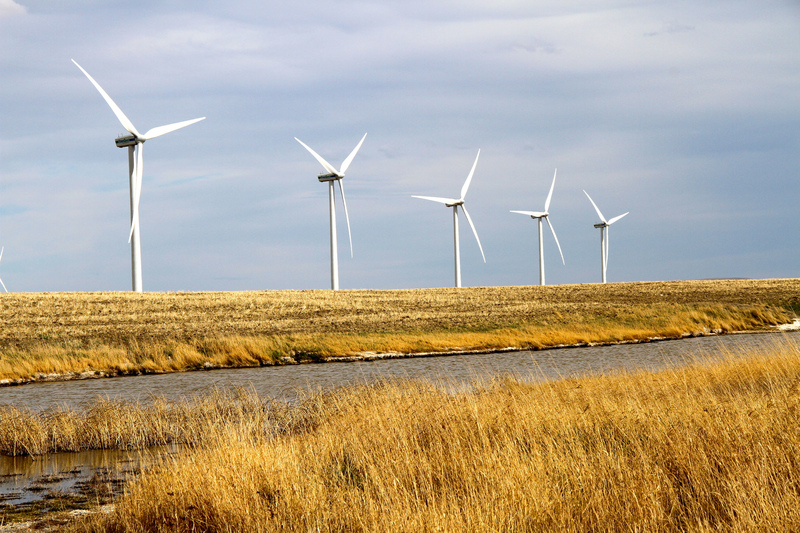 Following this example of alternative energy projects, three additional companies were chosen to build four more wind energy farms in southern Alberta. The farms are scheduled to open in 2019. The successful bids from Alberta’s Renewable Electricity Program will allow electricity prices to be set at an average of 3.7 cents per kilowatt per hour – the lowest electricity price in Canada. The increase in projects creates more jobs in alternative energy, with many laid off oil and gas workers currently training for jobs in the green energy sector. The current New Democratic Party has made sweeping progress in climate change, despite provincial anger. The NDP is rarely acknowledged for its principled leadership in pursuing environmentally conscious policy despite knowing it hurts their electoral support. The current Alberta government is a role model for the kind of political concessions often needed in order to take tangible steps towards addressing climate change. 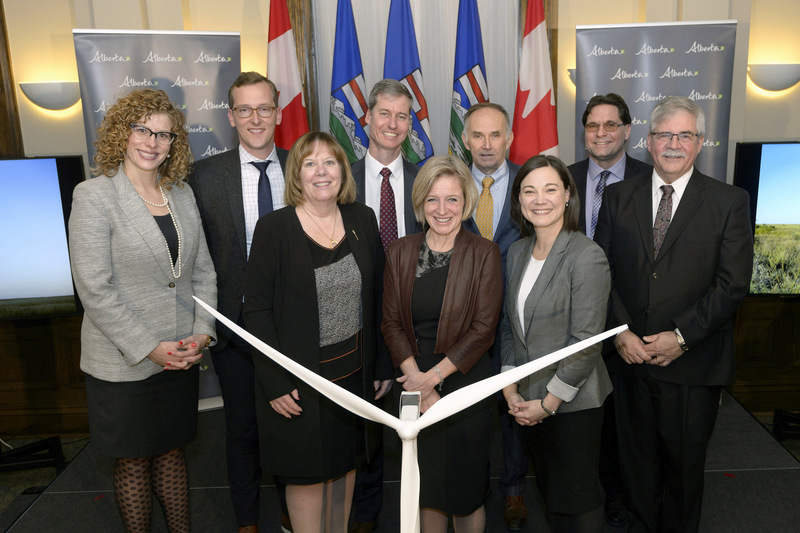 Alberta Premier Rachel Notley and team at project bids for Alberta’s Renewable Electricity Program. Since 1999, over 200 billion dollars have been invested in Alberta’s oil sands, acting as a major source of employment for the province as well as revenue for the entire country. As a historical source of livelihood for numerous communities, the oil and gas industry is not one that can be phased out easily. The International Energy Agency predicts that oil demand will peak in 2020 and fall after that, if stipulations in the Paris Agreement are strictly adhered to. Thus we rely on external factors such as the international community, global geopolitics, changing technology, and international markets to determine the fate of the oil and gas industry. However, this does not mean that federal and provincial governments and major national corporations should not play a role in the transition to green energy. The responsibility to address climate change should not fall solely on consumers who are told to recycle and buy electric cars. Governments and corporations must also incentivize environmentally conscious behaviour. For example, according to researchers from Simon Fraser University, more than one third of Canadians are willing to buy an electric or hybrid vehicle, despite electric cars making up only 1% of cars on the Canadian market. This is largely due to the lack of incentives for Canadians to purchase electric cars. There are no mandatory production targets, reimbursements, subsidies, awareness campaigns or rebates in Canada. It is evident that consumer support for green policies exist, and it is up to governments of all levels to help convert feelings into actions. In terms of climate change and environmental policies, Canada is faced with a unique hurdle of regionalism, stemming from federalism and the country’s large geographical size. A major issue with the dialogue around greenhouse gas emissions in Canada is that the prairie provinces (and Alberta in particular) have to carry the burden of being the “cause” of Canada’s pollution while the whole country consumes fossil fuels and benefits from the oil sands. If we want to address climate change as a nation, we must recognize that this discourse is divisive and ineffective, diverting attention away from the corporations that are in a position to make major contributions to lowering carbon emissions. While national carbon pricing is a diligent first step, Canada must implement more effective environmental policies in order to become a true leader in climate action. In light of the declining leadership and funds from the United States, Canada has the potential to become a global role model for climate action. The federal government has made strides internationally in climate leadership, but must continue to bolster the same kind of change at home.